In an earlier article (Considering the Words of Jesus for Social Justice and other Applications), I asserted that Jesus’ conversations during His earthly ministry fit into four general categories: (1) dialogues—usually intended to challenge particular people to repentance (right thinking about who God was and how one could be justified by Him); (2) pre-rejection public discourses about the kingdom—usually intended for broad audiences with a view to promulgating and clarifying the details of the kingdom so that the nation would understand clearly what was at stake; (3) post-rejection public discourse about the kingdom—usually in parable form, in fulfillment of prophecy, and for the purpose of hiding the truth from those who had already rejected; and (4) preparation of the disciples—often including private instruction so that those He had chosen would be prepared for the task of founding and leading the forthcoming church (assembly). With these contextual keys in view, let’s examine some passages often invoked to advocate for social justice. The goal here is (1) to discover what Jesus was actually advocating, and (2) whether or not government mandated social justice was on His agenda. Blessed are you who are poor, for yours is the kingdom of God (cf. Luke 6:20 and Matt. 5:3 and John 18:36). Notice that Matthew uses the phrase, “poor in spirit,” emphasizing the spiritual humility necessary to enter the kingdom. In John 18:36 Jesus responds to Pilate’s questioning whether Jesus was the king of the Jews. Jesus explains that His kingdom is not (present tense) of this world. He came offering a heavenly kingdom to be brought to earth, and it was rejected. He was still king, nonetheless, but the kingdom of the heavens (as Matthew records it) is still future. For two reasons, then, this is not a social justice passage. (1) spiritual poverty is not to be equated with physical poverty. Jesus’ comment was an extolling of spiritual humility. (2) Until Jesus returns to install the kingdom (i.e., Rev. 19-20), His kingdom is not of this world, thus present earthly benefits are not what He has in view. Now, it should be noted that Jesus’ words certainly do not oppose kindness and compassion (of course His ministry epitomized kindness and compassion), but these particular words (Luke 6:20, Matt. 5:3) have a very precisely-aimed meaning, and they are not addressing social issues in the present age. Heal the sick, raise the dead, cleanse the lepers, cast out demons; freely you received, freely give (cf. Matt. 10:8 and Luke 4:18-21, and 9:1-6). Context is always very important. Matthew 10:5 sets the context for the statement: “These twelve Jesus sent out after instructing them saying…” This is a record of Jesus’ commissioning of twelve specific men with instructions to freely use abilities or gifts that confirmed their divine message. That message was, “The kingdom of heaven is at hand” (Matt. 10:7). In Luke 4:18-21 and 7:18-23 Jesus appeals to Isaiah 35 and 61, in asserting that He was the Anointed One—the Messiah. The signs accompanying the arrival of Messiah included healing (Isa. 35:5-6) and would confirm the good news that He would proclaim (Isa. 61:1-2ff). The physical healing Christ brought served as a confirmation of His message. That He would likewise empower His disciples so that their message (His message) would also be confirmed was consistent with His program—which was a kingdom program (His heavenly kingdom come to earth in physical form as promised to David, 2 Sam. 7). Luke describes these comments as being part of a parable (Luke 14:7) about humility (Luke 14:11), and which concluded with a blessing and a reminder about the kingdom (Luke 14:15). Again, we see Jesus’ focus on the kingdom and the spiritual humility that would characterize it. Consequently, we can certainly draw social principles from His teaching—to show true love involves humility, and He commanded that His followers demonstrate love. If present day ethical mandates can be extrapolated from His teaching (and I believe they can), then we see they would be rooted in individual spiritual humility with a view to love one for another. Addressing His disciples directly (Luke 12:22), Jesus challenges them to pursue heavenly rather than earthly treasure. He reminds them of the connection between the heart and its treasure. Earlier in the passage (Luke 12:1-12) He gave them specific directives regarding how they were to deal with their forthcoming persecution. Again, these are not broadly applicable admonitions, necessarily—we have to recognize the primary applications of Jesus’ private instructions to specific men. Now, of course, we can draw a secondary application. Should we pursue heavenly rather than earthly treasure? Of course (e.g., see Col. 3:1-4). But whereas these disciples were commissioned literally to travel as missionaries, not being tied to one spot (Matt. 28:16-20, Acts 1:7-8), church age believers are not encouraged to physically walk away from their families and livelihoods, but rather to be faithful stewards of them (e.g., 1 Thess. 5; 2 Thess. 3). For whoever wishes to save his life shall lose it; but whoever loses his life for My sake shall find it (Matt. 16:25). Again, Jesus is specifically instructing His disciples (Matt. 16:24) and concludes the discussion with a statement that some of those standing there would witness His glory (a prophecy fulfilled six days later). Nonetheless, in this passage also we can understand a universal principle is in view (as evidenced by the third person singular pronouns utilized here). As Jesus is preparing these men for their difficult paths ahead, He reminds them all of the importance of spiritual humility and devotion to Him. This is one of the rare occasions that Jesus spoke plainly to the multitudes after His kingdom was rejected (this is closer in form to a dialogue for plain instruction than veiled parabolic teaching). He explains to them the true cost of discipleship—the single-mindedness of following Him. To “give up” (Gr., apotassetai) is to forsake. Importantly, to forsake all one’s possessions (not just some, but all), did not mean that the disciple could not possess anything, but rather that the disciple must understand that all possessions were from God, and for His use. Note for example 2 Corinthians 9:8, which asserts that having an abundance is a blessing specifically purposed for “every good deed.” In other words, God doesn’t forbid possessions; rather, He gives them for a purpose—His gratification, not ours. If you wish to be complete, go and sell your possessions and give to the poor, and you shall have treasure in heaven, and come, follow Me (Matt. 19:21, parallel in Mark 10:20-22 and Luke 18:12-23). Whereas the previous reference (Luke 14:33) discussed with a broad audience the cost of discipleship, this one addresses a specific individual. Here, Jesus challenges an individual who lacks spiritual humility. This man thought he could gain eternal life by his own good works (what good shall I do, ti agathon poieso). Jesus reminds him of the Law (which was given to show humanity’s inability to please God, and to show the need for grace—see Gal. 3). Rather than understand the important lesson the Law was intended to teach, the man missed the point entirely and was filled with spiritual pride—asserting he had obeyed fully. In order to show the man he had not followed the Law, Jesus calls him to sell all (not some, Luke 18:21) his possessions and give to the poor. The young man’s response demonstrated that he did not have love for his fellow man, and thus, he had broken the Law of Moses. Still, the man seemed unwilling to humble himself before God. Importantly, Jesus’ challenge to this young man was not a universal call for the selling of all possessions—He had already explained that the forsaking of all possessions was a part of true discipleship. To forsake does not mean to sell, but in this case, Jesus was challenging the young man to demonstrate that he had indeed forsaken his possessions. Also, recall the young man’s question was not about discipleship, but rather about eternal life. The man needed to recognize his need for the grace of God, and apparently, he was unwilling to value spiritual life over his temporal possessions. Render to Caesar the things that are Caesar’s and to God the things that are God’s (Matt. 22:21, parallel in Mark 12:17 and Luke 20:25). 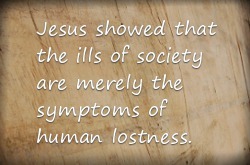 Jesus makes this comment in the context of discussing the appropriateness of paying taxes. Jesus could have argued that He was a divine king, not obligated to pay taxes to a human king. Instead, He communicated an important principle: that government and rulers have the right to extract taxes to pay for the function of the state. After all, money is created by the state. Hence, render to Caesar. Elsewhere, human government is described as bearing the sword and as being “a minister of God, an avenger who brings wrath upon the one who practices evil” (Rom. 13:4, also see 1 Pet. 2:13-17). The only biblically mandated universal cause for man to use the sword is in response to murder, in dealing with that great offense to the image of God (Gen. 9:6). Whereas in these passages we see limitations on the scope of government, it is worth noting that Jesus was not focused on the proper function of human government, but rather, His program was the kingdom. He did not lay out a utopian pattern for human government, rather, He focused on His kingdom which would be inhabited by those who were divinely empowered to ascend to His prescribed morality (e.g., the recipients of the New Covenant, Jer 31:33). Nonetheless, in dealing with government, Jesus advocated submission and respect. [Y]ou shall love your neighbor as yourself…(cf. Matt. 22:39; John 13:34-35, 15:12-13). In dialog with a Pharisee, Jesus explains that this is the second greatest commandment. If this were simply a great commandment in the Mosaic Law, then we would draw no ethical mandate from for today’s church-age believer (since the Law itself was for Israel). But because Jesus describes it as a lynchpin to the Law and the Prophets (a phrase He used to refer to the Hebrew Bible), it is an imperative that extends beyond the Mosaic Law, and thus applies to all who would follow Him (e.g., see Gal 5:13-24, noting that the first fruit of the Spirit is love). In light of that universal responsibility (love) for believers, note that love is a fruit produced by the work of the Holy Spirit in the believer, rather than by behavioristic or external forces. For I was hungry, and you gave Me something to eat; I was thirsty, and you gave me drink; I was a stranger, and you invited Me in; naked, and you clothed Me; I was sick, and you visited Me; I was in prison, and you came to me…to the extent that you did it to one of these brothers of Mine, even the least of them, you did it to Me. (Matt. 25:35-40). In what is famously called the Olivet Discourse, Jesus addresses his disciples privately (Matt. 24:3), instructing them regarding things to come. Interestingly, in chapter 25, Jesus emphasizes a principle that “to everyone who has shall more be given, and he shall have an abundance; but from the one who does not have, even what he has shall be taken away” (Matt. 25:29). The principle first appears in Matthew 25:3-4, contrasting the foolish (the unprepared) and the wise (the prepared). In both contexts the focus is on preparedness for Jesus’ coming and good stewardship with the resources He has given. As for the discussion of Matthew 25:35-40, the context is a judgment that takes place after the return of Christ. All the nations of that current generation (Matt. 25:32) are brought before Jesus to be judged for how they treated His “brothers” (probably believers—both Jew and Gentile) during the tribulation period. This is not a judgment for all peoples of all times, but rather a judgment for deeds done in a particular age—and not the one we are in now. Certainly, there are other passages that speak of judgment for deeds done in the present age. One for believers and not related to positional eternal standing (1 Cor. 3:10-15), and one for unbelievers that is related to positional eternal standing (Rev. 20: 11-15). The “sheep/goat” judgment in Matthew 25 is distinct from both. In any case, this would be a very difficult passage to connect to a present day social justice agenda for at least two reasons: (1) the rich-get-richer passages in the context (e.g., Matt. 25:29), and (2) the timing and distinctiveness of this particular judgment. These are a few examples of how statements made by Christ, which might appear at first glance to describe a social justice agenda, really don’t. Instead, His focus is on His coming kingdom and on the redemption and deliverance only He can provide. In the meantime, while we await the installation of that kingdom, He has divinely empowered the assembly—the church, His body, His instrument—with spiritual gifts for the common good (1 Cor. 12:7ff). That body is to pursue, with perseverance and urgency, doing good “to all men, and especially to those who are of the household of faith” (Gal 6:10). Consequently, individual believers have tremendous responsibilities in demonstrating love to other believers and to unbelievers. Likewise, believers have a corporate responsibility—as the collective body of Christ, in this present church age, to do good to all men. Clearly the focus is on spiritual things, but the believers’ responsibilities of love are certainly not limited to spiritual expressions. As James writes, “If a brother or sister is without clothing and in need of daily food, and one of you says to them, “Go in peace, be warmed and filled,” and yet you do not give them what is necessary for their body, what use is that?” (James 2:15-16). Again, he says, “This is pure and undefiled religion in the sight of our God and Father, to visit orphans and widows in their distress, and to keep oneself unstained by the world” (James 1:27). Jesus did not come to repair the human condition (sin and separateness from God) by recalibrating society, redistributing resources, or simply meeting physical needs. Rather He came announcing and providing for redemption and restoration through His own sacrifice on the cross. In His teaching, He showed adroitly that the ills of society are merely the symptoms of human lostness, and He provided the remedy if we will but believe in Him. For those who have believed in Him—He calls them to demonstrate His love to those who are suffering from the symptoms. Still, we must keep in mind that the endgame is not alleviating the symptoms, but rather eradicating the problem itself. Absolutely edifying and effectively written. It both affirms the clear truth about the relevant passages and deconstructs the unfortunately rather broadly accepted (or in the least tolerated) social justice theology based on such passages within conservative evangelicalism. There has been quite the push back by many conservative evangelical leaders concerning many of these passages of scripture. Leaders such as DeYoung/Gilbert and/or Al Mohler (his debate against Jim Wallis) have argued the same thing as Dr. Cone. At my conservative evangelical seminary (Grand Rapid Theological Seminary), my New Testament Prof, Dr. Meadors dealt with several of these same passages and came to similar positions as Dr. Cone too. I'd be interested in knowing which conservative evangelicals are either tolerating or advocating these positions, especially with more government intervention in mind with regards to social justice. "Red-Letter" evangelicals such as Ron Sider, Tony Campolo, Jim Wallis, and Shane Claiborne embrace the view that Dr. Cone argues against (as well as others bad theological constructs that Dr. Cone didn't mention). But they are part of the evangelical left. I've also heard mega church pastors such as Bill Hybels embrace certain passages like these as well. But they are hardly considered conservative evangelicals. Not many, maybe, but associations which demonstrate tolerance of such error are many in my view. Beyond that, however, one can find lesser but certain forms of SJ theology with CE's who might claim otherwise possibly due to imprecise or careless vetting of their own theology. But the CE's which do hold to this are, to me, rather aggressive and out front as often as possible, Russell Moore being one of them. But naming names I am sure wasn't the main objective of the series. There is a difference between Cone's interpretation of the sheep and goats passage and CE leaders, however. Most CE leaders (Piper, DeYoung, Gilbert, etc...) interpret "the least of these brothers of mine" as either followers of Jesus who are poor and/or poor missionaries, which is consistent with almost 1900 years of what the church at-large generally taught about this passage (Sherman W. Gray's The Least of My Brothers Matthew 25:31-46 A History of Interpretation) This is not to put down the dispensational interpretation of the sheep and goats. But it is a 20th century development. Either way, the Texas Baptist Standard's Editorial interpreted the least of these pertaining to all the poor, which was a minority position throughout history but gained prominence as our world entered the industrial age during the enlightenment. It is the position of Ron Sider. He passionately argued for this in his landmark book, "Rich Christians in an Age of Hunger."